Rigg is a British furniture manufacturer based in Birmingham making tables & other furniture for offices, education and hospitality. Take a look at our Instagram furniture page for extra pictures. 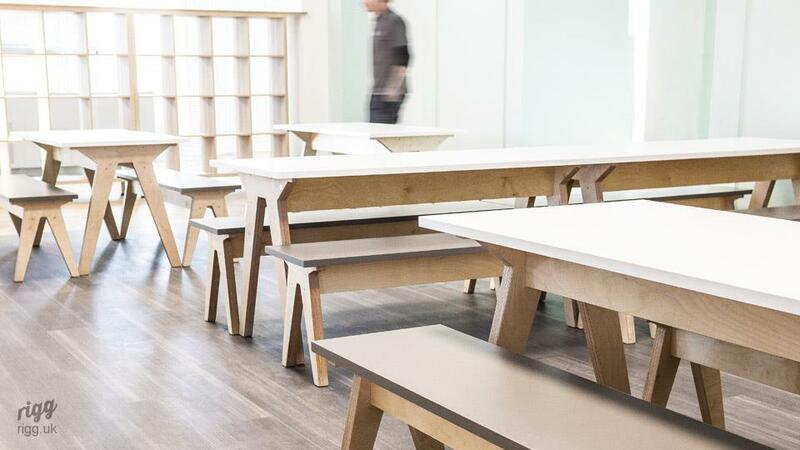 Product highlight: A high table with pure, elegant form - from birch plywood. From our large manufacturing workshops in Birmingham, UK we have multi-disciplinary, enthusiastic staff working on a wide range of projects including our own ranges of tables and other products. Our in-house skills include metalwork and woodwork. This means that we can make special one-offs (such as a beautiful copper bar for Ibis) and multiples of standard items (such as educational desks). We have a large and diverse customer base including the educational, hospitality and office sectors. A large part of our business includes furniture for office moves and other workplace installations. Since we were established in 2004 our customers include many top furniture specifiers, fit-out companies and well-known brands such as YHA, Whittards and Royal Albert Hall to name a few. Indirectly our products are also supplied into many large office schemes and developments. Our dining tables and coffee tables ranges use an eclectic mix of materials including wood, plywood, metals (zinc, copper, brass), laminates/HPL, linoleum. If anything characterises our work it is this variety, rather than just be constrained by one. We are able to achieve this as we have wood and metalworking facilities on one site. Thus, in-house we have a diverse range of skills relating to furniture manufacture. We have also introduced hall tables to our website and dining tables with benches. Pinterest has quite a few images of our work. Our range of dining tables includes regular tables with four legs to more unusual industrial style pedestal tables. Metal legs are quite common in our dining table designs, but we also have designs with wooden legs in a more traditional style. Our pieces are designed with strong basic design principles and hence might appeal to those looking for a Scandinavian dining table, for example. Durability is important to us and you will find that your purchase becomes more than a place to eat - it becomes a partner for life. As with our larger pieces, we offer a diverse selection of coffee tables, with probably a design for everyone. Materials used include steel, wood, copper, brass, zinc and glass. Please see our Contract Tables section for more designs and ideas. We have supplied numerous projects for desking, conference, meeting and breakout tables and other furniture. See our features on Buyers Guide to Breakout Furniture, Breakout Tables for the Workplace and Reception Desks. A large part of the experience of an employee is how their environment is designed and managed. Rigg has supplied many contemporary office tables across a wide range of businesses. You might also like to view our LinkedIn page.